As a founder that has worked with the internationalization of GeekGirlMeetup, one thing that strikes me is strong belief that we need a diverse uptake of ideas (womens ideas) to create the next Skype and Spotify. One way to get more women into the STEM/ ICT area is to elevate the fantastic women that are already out there. If you have ideas of how to help us with our mission please don’t hesitate to contact us to grow the network or to bring new ideas to the organisation and out to the society. And what better way, but to celebrate the wonders of technology by playing with it! GeekGirlMeetup is themed “Make IT” this year at the Science museum in Stockholm Sweden on May 24-25th. Sign up now for tickets and speaking and lets co-create an amazing weekend. This year we will as the theme suggest be geeking-out in maker-culture. Expect 3-printing, hardware, trans-humanism, knitting workshops and manga-creation. 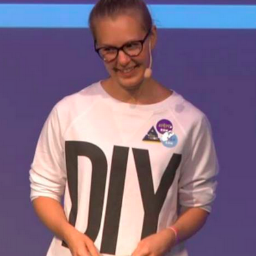 With speakers, maker and creators like Stockholm maker-space, Carin Ism, Robot-Robyn, Johanna Koljonen, Nina von Rüdinger we expect total geekdom-ness at the three threads of ‪#‎creativetechnology ‬‪#‎socialbusiness‬ and ‪#‎justepic‬. After-party at Spotify! GeekGirlMeetup is a un-conference for women in web, code and startups aiming to elevate female role-models, create new networks and active knowledge exchange.